With their beautiful yellow flowers growing sunflowers is a great way to teach children about plant life cycles. We've a lovely set of activities and printables to help you get the most from the topic. Sunflower seeds have black and white stripes. When the seeds are planted in the ground or they fall from the seed head and settle they can begin to grow. About 3 days after planting the seed will germinate. This means that the hard shell softens and splits. Roots begin to grow downwards and a shoot will grow upwards. After about a week the shoot will appear above the soil. Then leaves will start to grow. As time passes the leaves and stem will get taller, wider and thicker. As the plant grows buds will form. These will begin to unfold into petals. The sunflower reaches adulthood and the flower blooms. The plant wilts and dies. The seed head dries out and releases the seeds for the cycle to begin again. As the kids fill in the missing words in this sunflower lifecycle cloze, they will be learning a little about the lifecycle of the sunflower plant. It's incredible how a sunflower grows from a tiny seed to such a tall, majestic plant! We've drawn the entire lifecycle of these lovely flowers on one page for the kids to colour in. Choose from a ready-labelled version or a blank version which they can label themselves. This set of 6 colouring pages covers the lifecycle of a sunflower plant. Once you've coloured them in they look great on classroom walls and displays. For an extra challenge, choose the blank set and label each phase of the lifecycle too. Challenge the kids on their knowledge of the sunflower plant lifecycle with this fun labelling worksheet. Use the correct words from the box to label the sunflower lifecycle diagram on this worksheet. You can choose from our pre-coloured version of this worksheet, or black and white so you can colour the pictures in yourself. Can you tell the difference between a young plant and an adult plant, and the other phases in the life cycle of sunflower? Use this fun matching worksheet to test your knowledge. When you are learning about the life cycle of a sunflower, print these useful notebooking pages to keep your notes safe! We have two variations for each stage of the life cycle. These stunning posters are perfect to display in the classroom if you're learning about the life cycle of a sunflower plant. Print using the borderless settings on your printer for the best results. 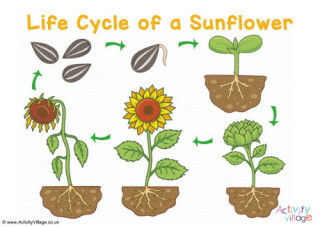 Learn about the life cycle of a sunflower from seed to full-grown plant with the help of this simple poster, available with or without labels. Are you learning about the life cycle of plants? This set of 6 posters illustrates the lifecycle of a sunflower and are ideal for classroom displays. Cut out the pretty sunflower life cycle pictures from the first sheet of this printable (in colour or black and white), then arrange in the order of the sunflower plant lifecycle. Then glue the pictures onto the second sheet to complete the sunflower lifecycle diagram! Watch this sunflower cycle pdf slideshow with the kids on your computer screen or whiteboard. There are eight slides to help the kids understand and learn the life cycle and growth processes of the sunflower plant. Use this sunflower life cycle story paper to write about your own experience of growing sunflowers, or to describe the picture. We have four versions to choose from, with lines or handwriting lines, and a choice of ready-coloured or black and white. 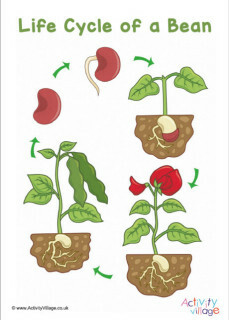 The kids can describe the life cycle of a sunflower on this story paper using the picture to guide them. Choose from one of four versions below (colour/black and white, with lines or handwriting lines). There are no labels on these sunflower life cycle story papers, so can the kids describe the process themselves on each page. We've got four versions to choose from below, either lined or with handwriting lines, and in colour or black and white. Use these four sunflower life cycle story papers to write about your own experience of growing a sunflower, or to describe the scenes in each picture. We have four versions to choose from, with lines or handwriting lines, and a choice of ready-coloured or black and white.